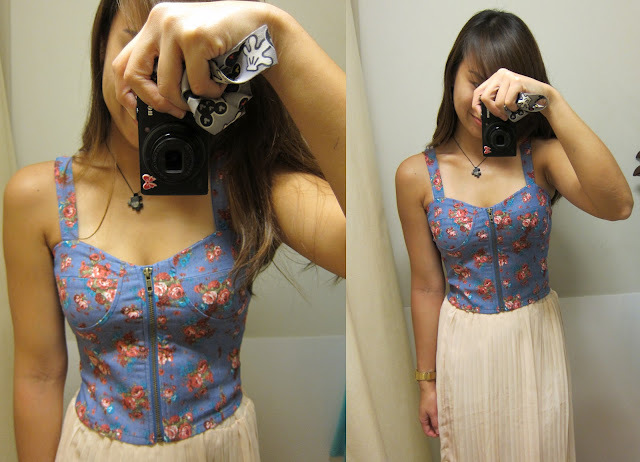 The prints are soooooo similar to LRH Hooked Denim Bloom Bustier Top in Washed & Classic!! I was tempted to get my pc from LRH initially till I saw AA’s preview. 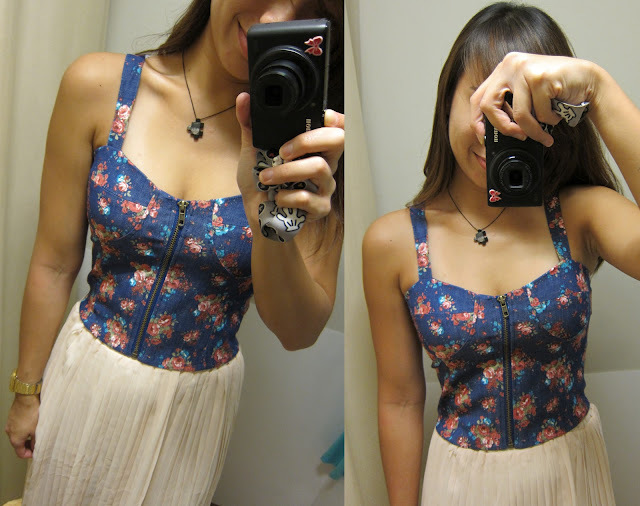 I tot must well try AA’s for a different design to my LRH Hooked White Floral Bustier Top. 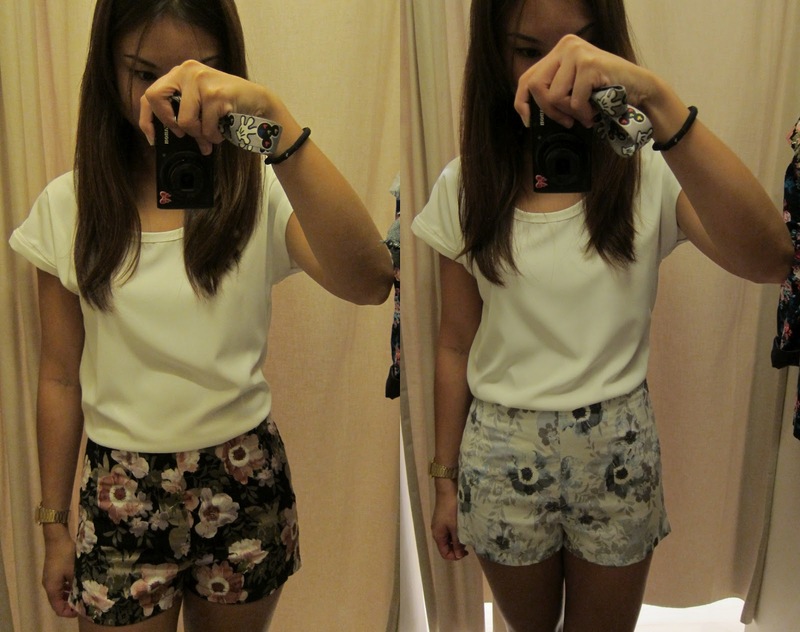 - Tagged S$31.90 at KJ. - Bust area not padded. No under-wire under bust or body area as well. - Front zipper for easy wearing. - Denim is rather stretchable & THICKER as compared to LRH. - Size M fits me comfortably at the ptp & waist area. - Length ends around my midriff; thus high waist bottoms will be recommended if you don’t feel comfortable revealing tummy area like me. 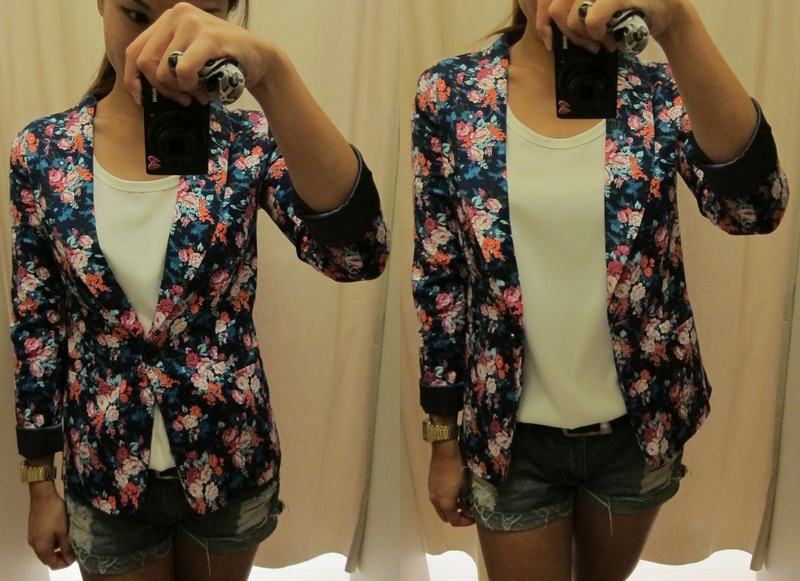 There are so many different kinds of blazers selling online, till I really dunno which to get. Anyway, I seldom wear outer wear like cardigan or blazers, unless required to. Definitely not a blazer person just to match my outfit. The crazy SG weather just doesn’t allow me to do this!!! - Tagged S$39.90 at KJ. - The White pc (Size S) fits me just slightly snug, but still acceptable. Prefer this size though. - Blazer is of comfy cotton. Very lightly sponged feel. - Fully lined; single button closure at the front. - Colous available are: Black, Crimson & White. - Personally prefer the white over crimson pc. Once again, the prints on this dress are almost 99.9% similar to LRH. No Size M for the black pc so I just squeeze myself through the Size S.
- Non-removable padded bust area. - Adjustable straps. Left side zip. - No under-wire below the cups or body area. - Much thicker cotton rayon material compared to LRH ones, which is thinner. - Not lined. Not sheer. - Tight for me at the PTP area since is Size S; but fits rather comfortably at the waist & hips area due to the elastic back. Since Size S fits me nicely except for the PTP issue, I doubt I will get the Size M which I assume it might be loose all over no doubt it fits nicely at the PTP. - Tagged S$36.90 at KJ. - NO MGG label. So I guess it is not self-manufactured. - Very refreshing mint colour. - Highly stretchable rayon material. - Length just nice for me. - Seamless undies will be recommended for this pants, else VPL will be obvious. - Colous available are: Black, Mint, Purple (Grimace Purple colour) & Fluoro Yellow (Bright Yellow; not pastel as shown in MGG fb page). - Size M fits me comfortably at the waist & thigh area. - Material is quite stretchable, with inner lining.